Mark Lim - The last time I ate at IHOP was when I was camping Utah and on the way to the emergency room. We don't normally eat at IHOP when we go camping but this was special occasion. I was the fist one to wake up that morning and decided to throw rocks at people's tents just to be a turd. The last rock I threw was at my sister-in-law's tent and of course, dislocated my shoulder. I ran to get help because it was out of socket pretty far. I forgot the lie I told when they asked what happened but I remember it was better than throwing rocks at people's tents. We tried really hard to yank my shoulder back into socket with no luck. Painful as hell. My wife finally decided to drive me to the ER an hour down the mountain and as we were closing in on the hospital we hit a bump and popped my shoulder back in. We celebrated by eating at IHOP. Today our goal for our ACU Web lunch was to try out a new BBQ place but for some reason we got lost and ended up at IHOP. I really wanted a normal breakfast but I could not pass up Chicken and Waffles. Tyler, our programmer, claimed that he could eat a ton of pancakes and went for the all you can eat. We all decided to bet him some money to see how much he could really handle. If he ate 15 pancakes we would give him $30. If he ate 20 pancakes we'd give him $50. If he ate less than $10 he would give us all $5. Tyler was a total baby about everything but was able to eat 10.5 pancakes, just enough so he wouldn't have to pay us. Austin ordered a deep fried cheesecake with fried bananas which I ended up eating half of. I don't normally like cheesecake but It was the most amazing dessert I've ever had. All that fried crispiness, that sweet banana, and that the creamy cheesecake totally hit the spot after eating a mound of waffles and chicken. Satisfaction: 6 It was ok. I kind of expected something more epic. As far as the Chicken and Waffles, they were ok. 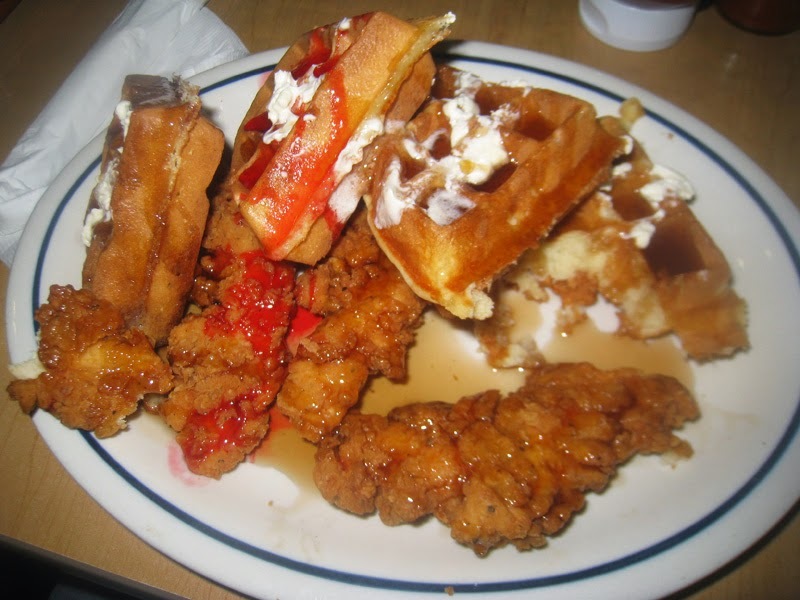 The chicken pieces were really dry but the waffles were pretty good. I really wanted bone in chicken and asked if they could substitute it and they said no which was a big disappointment but I ended up eating some of Max's fried chicken dinner left overs so it all worked out in the end. I'm really getting unhealthy. With an office job and lunches out every day I think I have to exert a little self control. YOLO.